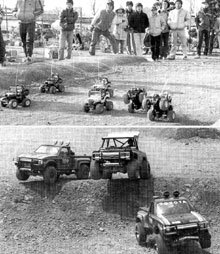 My fiancee is sat at the side of me reading the latest in depth novel from a well known author and there's me, at fourty still sat reading and drooling over the glorious pictures in my old Tamiya RC guide books! Why? Or do I have to ask you this? You all know where I'm coming from right? I hope so, or is it just me? A passion from way back when many of the perfectly painted cars were a dream to see in the flesh never mind own! I looked in ore at the tracks and racing, wondering what it would be like to be there using a 'real' RC off road circuit? And joining in on all the fun! There's guys tinkering, tuning up their cars in the pits ready for the next race. 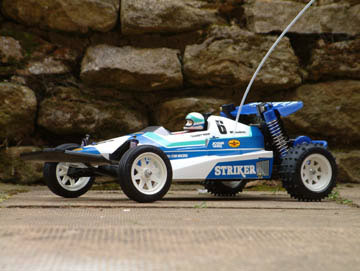 A race full of now rare expensive vintage Tamiya's! 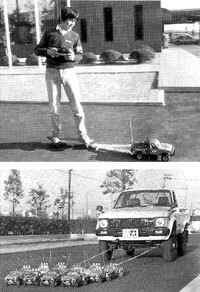 Reading these old guide books you get a real sense of 'the early days of RC' A sense of excitement and naivety from the way it's written to the way the pictures show you how to get the best out of your model car. 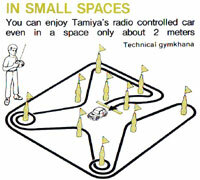 On any surface, and in any conditions you can have fun with your Tamiya. Imagine how much fun you could have here! Funny, this is just what I'm like now! I just wana be there.. So, this got me thinking. It's about time I got this down on paper, well web page. My feelings, my passion, that still lives on thirty years after it all started! And as you read this, I know most of you out there will feel EXACTLY the same. Big grin? Any wonder! Bet that's the 2nd place guy behind..
Not as easy as it may seem..
Mum, my dads Hilux has broken down again! I wonder how long these delicate hard bodies lasted? it's still with most of us now! We've seen it all before, but come on.. Mouth watering or what?! 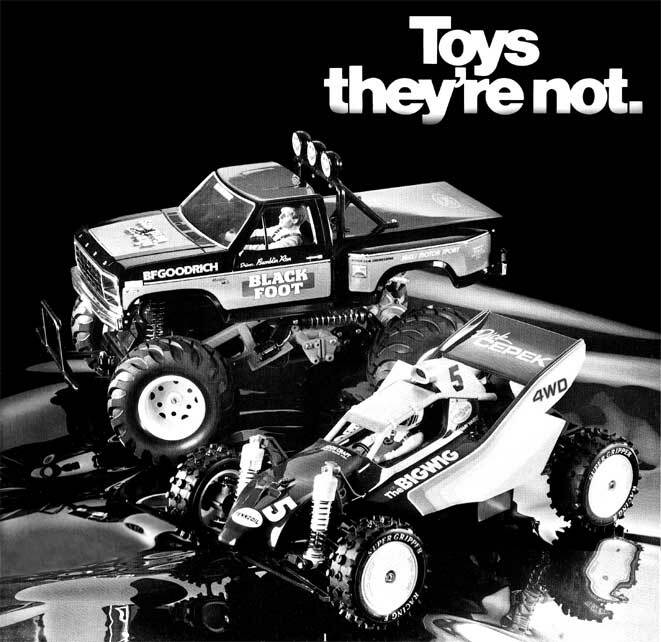 I remember when i was in grade 7, the first real rc car i wanted was the hotshot. But i couldnt afford one because i was very young and didnt have a job." I was probably only 13 years old'. 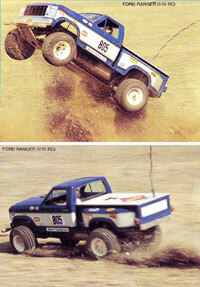 The tamiya guide books is were i first saw these amazing works of art. Hours and hours of longing for one of perfectly painted beauties only excited me more which in turn became a life long hobbie. 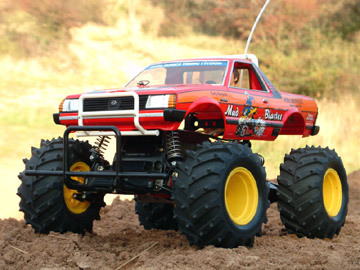 I finally saved enought money some how, and bought the brand new Tamiya Mud Blaster. 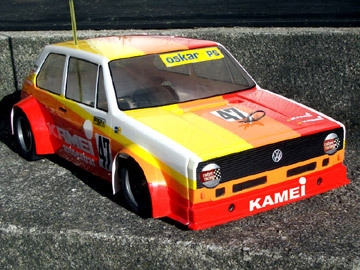 I loved building and painting the highly detailed kit, and also loved the fact that i would absolutely anilate any one else's so called RC car in my neighbourhood. 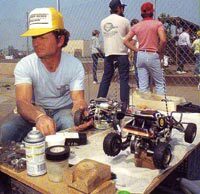 I have owned many other RC vehicles in my lifetime and raced competivlely for years but will always have the fondest memories of the original Tamiya RC cars. makes me a bit sad that i kinda missed out on it back then though, and clubs etc never seemed to exist where i lived. Yep! Totally on the same page, can't get enough of the sand scorcher and rough rider buggys. Saddley though I gave my old cattalogs away many years ago! Just waighting for an opertunity to score a couple from the bay! To replace them. Somethimes everything seems to be difficult.Work,bills,sad people all around us.In those guides you enter the world of magic,a world where beauty,friendchip and happiness have no limits.More than 30 years that I almost read every evening in those guides and every evening I am still amazed about articles or details I haven't seen before. 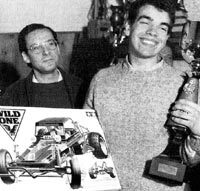 Mr Tamiya,thanks for make us dream soo many years. Thanks Moosey for this article that made my day for sure and keep on the good work. Yep, I'm with you too. All us 40'ish year olds who had the pleasure of being there at the time when the first SRB's were released - it's an incredible feeling of nostalgia. I'm sure you understand me when I say I can just sit for hours looking at the 3speeds, SRB's and of course Willy ! I want to go back - when life was all just Madness and Sand Scorchers ! This part of history lives on....because of us. 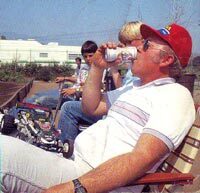 A long time ago in a galaxy far away, when aluminium cans had right-angled tops, instead of a weird bevel, sat two young guys with a bmx and a raleigh chopper wondering how cool to have PROPER remote control cars just like in the model car mags. Off we trundled to deansgate in manchester and a high street in congleton to get a Hotshot 2 and a clodbuster. Fast forward a few parsecs and now you still have two guys, both married with respective kids and still drooling over the sight of an unbuilt Superclodbuster in its box. Even the tyres smell the same as they did twenty odd years ago. Shut your eyes and your there!! The smell of damper oil on sweaty hands trying to get a tiny nut on a thread. Amongst the chaos and riots in this mad world we live in, thank the maker there is one constant......TAMIYA. Help me Obi Wan Tamiya, your my only hope!!! Moosey! I'm with you! Still today I stare in awe at all the guys whos driving their cars like there was no tomorrow! As other said no we got money and can do exact as they did but don't have the gutts! (Except you guy when you shoot your dvd's). Now I got some Sand Scorchers and Rough Riders and do run them, but NOT on anything near something looking like a dirttrack! Also got a Blazing Blazer that I've only run once. I'm not running it any more as I'm going to get another one for running... Awesome reading and awesome vids from you guys! Thanks! Best reguards from Sweden! I know just how you feel. 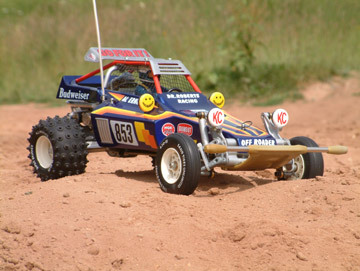 I remember sitting in my sixth grade school library one day and coming across an article of the tamiya sand scorcher that would be for sale by the time I read the article. It was about a five page article in the magazine, with lots of pictures. I remember looking at the realistic looking shocks that were on it. The SS that I was looking at even showed the optional dual rear shocks that you could get for it. And a few other mods that I don't remember. I was in such awe staring at that buggy that I couldn't stop thinking about it for..........well I still havn't stopped thinking about it. It was foremost on my mind when I started collecting vintage about four years ago. And now I can say I have a very nice specimen sitting on my shelf. You are right about one thing. 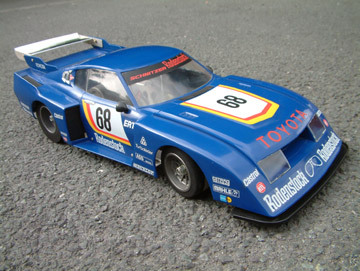 Its easier now to spend several thousand dollars on a model than it was for me to buy one back in the day. Back then I would have and did drive my RCs into the ground until there was nothing left to salvage. Now I can barely bring myself to sit one in the dirt for pictures. One thing is still the same though. Perhaps others have done this as well. Sleep with your newest toy right next to you on the nightstand. So it can be viewed the instant your eyes open in the morning. Thanks, slimmy. Got the books 30 years now!! I feel much better after reading that. 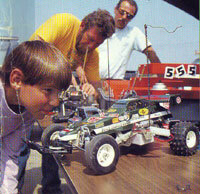 At the age of 41 I'm glad I'm not the only chap who still pours over those RC guides lust like I did when I was a kid. This time its better as the cash is there to fulfill those dreams.